Features a gorgeous depiction of the Amazon River Basin. This is a 1728 John Senex and Edmond Halley map of Brazil and Guiana. 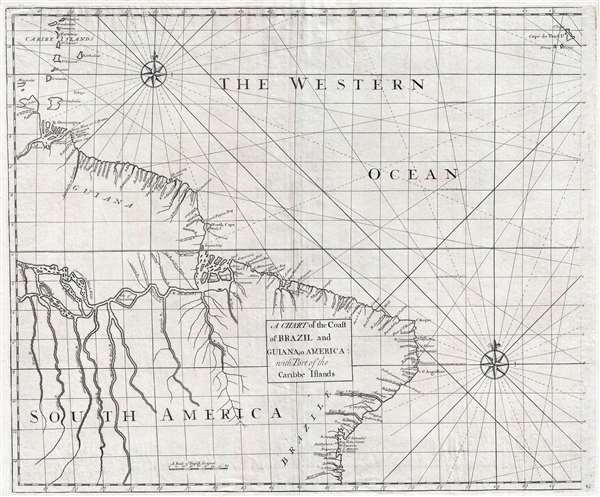 The map depicts the coast of South America from the mouth of the Orinoco (Oronoque) River to All Saint's Bay / Baia de Todos os Santos (labeled as Bay Todos Santos) and Salvador, Brazil and from the Lesser Antilles to the Cape Verde Islands. Featuring an incredible illustration of the Amazon River, individual islands within the river are labeled. Not only are several tributaries of the Amazon depicted in detail, but they are also labeled, including the Tapajós (Tapaysos) River. Both the Orinoco and Amazon Deltas are illustrated in detail. Cayenne, in modern-day French Guiana, is also labeled. Several of the Lesser Antilles are depicted and labeled in the upper left corner, including Guadeloupe, Martinique, St. Lucia, St. Vincent, Barbados, Grenada, and Trinidad and Tobago. This map was a collaboration between John Senex, Edmond Halley, Nathaniel Cutler, and Samuel Parker. It was published in John Senex's 1728 Atlas Maritimus and Commercialis, which was issued in an attempt to compete with Mount and Page's English Pilot, but never achieved the commercial success of the latter work. Halley's Atlantic chart is not only the first printed map of isogones, which were known as Halleyan lines for about a century, but it appears to be the earliest published isarithmic map of any kind. In quantitative cartography, isarithms (isolines) are lines, in series, connecting points of equal intensity of phenomena which have transitional degrees of intensity. Halley's final cartographic contribution deals with a map entitled 'A Description of the Passage of the Shadow of the Moon over England in the Total Eclipse of the Sun on the 22nd Day of April 1715 in the Morning'. The general map, in itself, is unremarkable, but the map's theme is both interesting and original. The map traces the path and shadow of the eclipse and indicates the time it took the eclipse to cross England. Senex, J., Atlas Maritimus and Commercialis… (London) 1728.